Looking for a simple solution for placing liquid fertilizer that has all the features to get you up and running quickly with no hassles? Over the years AgXcel has found many features and parts that are required to complete an in-furrow starter system that does not leave you high and dry when applying liquid. The AgXcel single pump solution with a MANX manual rate controller is a complete kit and is a perfect solution for 8-12 row planers and smaller drills requiring low volume in-furrow liquid fertilizer application requirements. Below is a detailed list of items that come complete with each AgXcel GX1 Fertilizer Application System. Wilger floating ball manifold assembly for each row or the optional PVC pipe manifolds. Each manifold solution comes pre-configured and fully assembled with the appropriate floating balls installed and mounted on a custom laser cut powder coated bracket. The Wilger manifold solution also comes kitted and mounted with a white laser cut back panel mount for easy viewing. 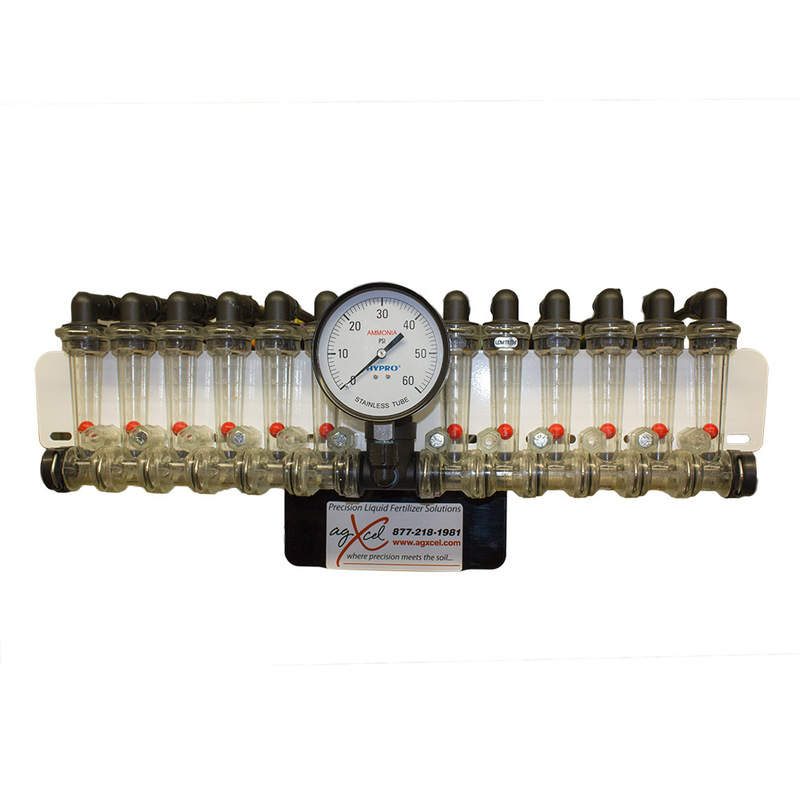 3 sets of orifices in each kit to ensure the flexibility of flow ranges and the ability to change rates on a wide scale. 2 filters with 50 & 80 mesh screens that ensure that liquid is clean when passing through orifices. 50ft 3/4" for feed from tank to pump input feed along with a 3/4” ball valve for tank feed shut off after daily use or maintenance. One AgXcel custom designed agricultural rated 5.3 GPM at 60PSI open flow. Each pump is configured with an internal bypass mechanism and embedded check valve to ensure proper system pressure is maintained and no backflow from fertilizer tank is drawn and wasted. All harness are weather coated and with weather packed fittings to withstand even the harshest conditions. 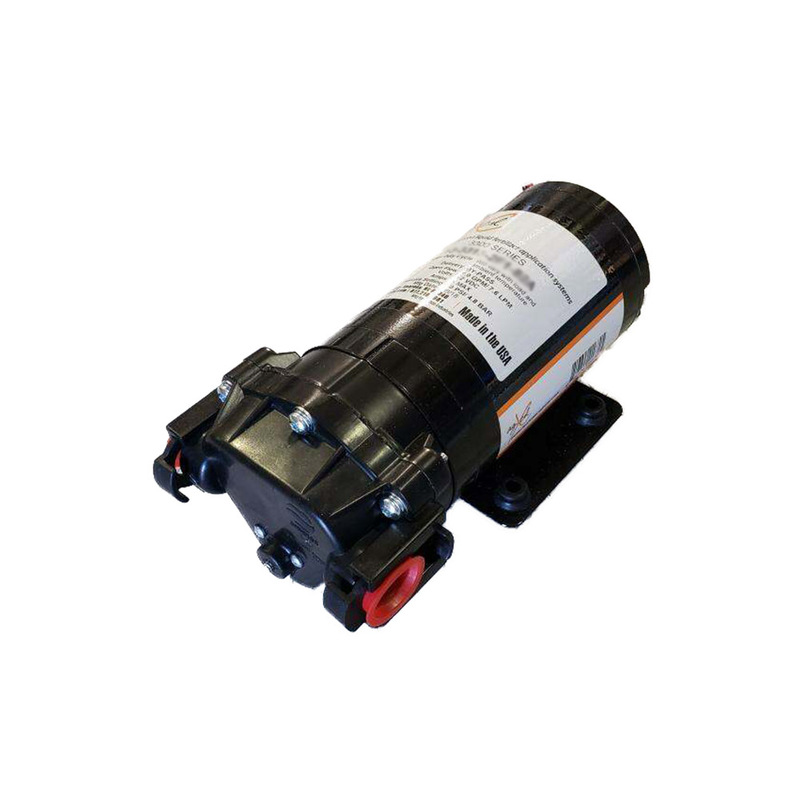 The AgXcel electric pump is lined and sealed internally to keep out the weather environments and moisture to assist in the durability and lasting service of the pump. The AgXcel automatic implement switch that is included in every kit ensures that the system gets put into a “hold” state when that implement is raised and then returns the system into its normal running state once the implement is lowered. A special mounting bracket is also included in the kit for the flexibility of mounting in various locations. The harness for the implement switch is also designed to break at the hitch for ease of release when removing the implement. 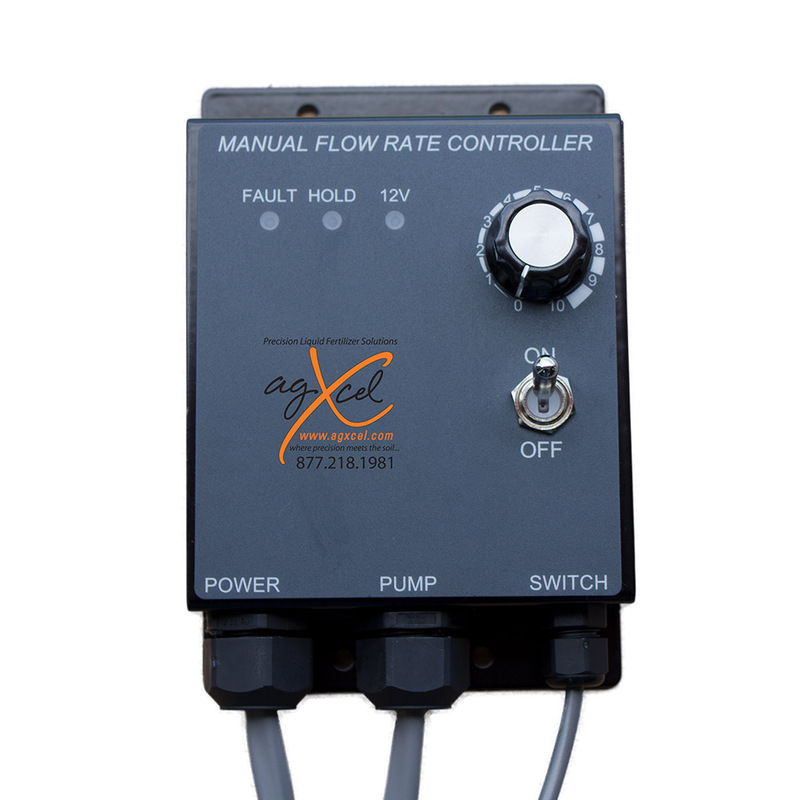 The AgXcel MANX manual rate controller allows for the management of system pressure with a simple to use with radial dial to increase or decrease voltage to the AgXcel pumps to manage the speed of the pumps. valve mounting locations, tube length and orifice placement. 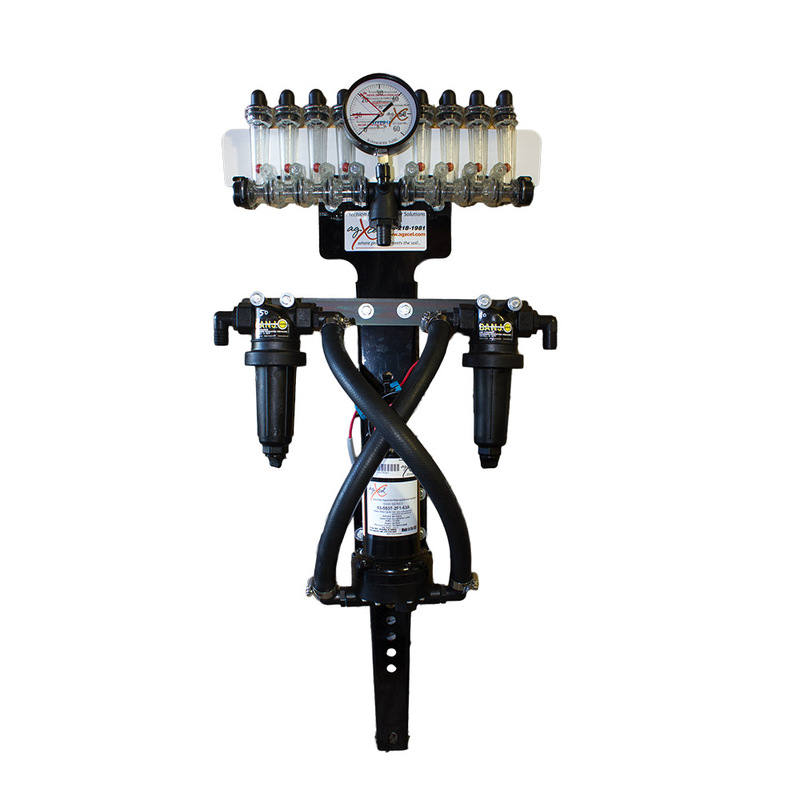 As with all AgXcel precision fertilizer application systems, in an effort to ensure that the GPA requirement is met, comes pre-assembled with a GX1 laser cut powder coated solid stand, dual filters are mounted and all hoses are pre-cut, fitted and plumbed to ensure proper flow is met and system pressure is maintained.